I was born in South Korea and grew up in acountry where Taekwondo is ingrained in its culture. In Korea, taekwondo training is mandatory, similar to physical training (PE) here in the U.S.. My martial arts training began in elementary through High schools. In the later years of High School I also started training in GUMDO (the way of the Sword) and joined the High School team which is famous in Korea. After High School, mandatory military service for both men and women, came calling. During this 3 year period I furthered my Gumdo training and began schooling in HAPKIDO. After military service and with a dream, I got my first job working for the Korean Government in the Public Prosecutors office. For the next 15 years I worked and trained in Taekwondo and Gumdo prior to the United States. Once here, my family and I opened a small business in McKinney Texas where we saved for the dream of opening a Martial Arts School. In the meantime, I worked at several martial arts schools in the surrounding honing skills and deepening the understanding of the English language. 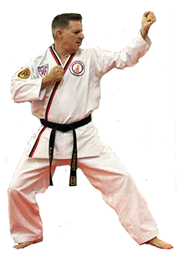 I began my martial arts career in 1982 in Jacksonville Arkansas at the age of twelve (12), I've been involved in the International Taekwondo Federation (ITF), World Taekwondo Federation (WTF), and Songahm Taekwondo. I attained my 1st Degree (Dan) Black Belt in 1988 at the age of 18. I attained my 3rd Degree Black Belt in 2012 in Songham Taekwondo, a Black Belt in Krav Maga, and an Instructor in Saing Jhon Do. My greatest joy is when I helped graduate many black belts over the years and gets a great deal of satisfaction in seeing the transformation results of his students from shy, socially challenged kids into confident, strong students physically, spiritually, and emotionally. Mr. Bousquet could not have gotten where he is without the loving support of his faith, wonderful wife and girls, and extended family.